HOT FOR TEACHER!!! We're BACK!!! To show our appreciation to all of the educators out there, we are pleased to bring back our HOT FOR TEACHER special! These special rates apply in all of our accommodations. 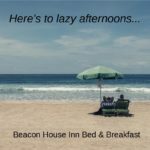 You can choose from our adults only retreat in our vintage beach house Bed & Breakfast or a pet and family friendly vacation cottage at the beach. We have a downtown City Flat that is also pet friendly, so no matter how you are traveling this summer-with the family and the dogs or just the two of you, we have a place for you to unwind. If you are looking for a no hassle beach retreat we have a simple itinerary for you. Enjoy an artisan breakfast and gourmet coffee. Take a yoga class at the Salty Dog Yoga & Surf and do a little shopping at Island Wellness. Beach chairs and umbrellas can be set up for you ahead of time by Pleasure Island Rentals. Dine on fresh, local fare at SurfHouse for a true farm to table experience. Take an after dinner walk along the boardwalk for a Gelato and a coffee. Simple pleasures. Our City and Surf package is your opportunity to make the most of our entire area. Take in a little city life as you explore historic downtown for a few days before heading to relax in the sun and sand of Carolina Beach. Our fantastic mid-week specials offer the advantage traveling on days when the beach is much less crowded and restaurants and attractions are easier to enjoy. You can learn more on our website or give us a call to learn more about our specials and packages! We look forward to sharing the best of Wilmington and Carolina Beach with you this summer!